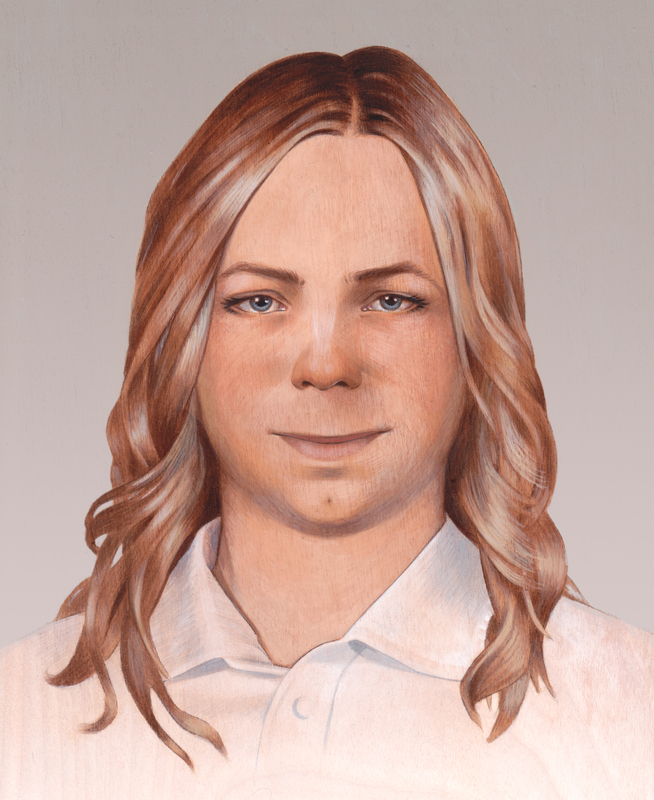 Chelsea Manning (assigned male and named Bradley Manning at birth) is a young trans* woman, currently serving a 35 year sentence in a US military prison for exposing some of the most horrific realities of the War on Terror. As an Intelligence Analyst in the US military in Iraq in 2009, aged 22, she blew the whistle on war crimes, widespread human rights abuses, including torture, and revealed evidence not just of a few ‘smoking gun’ issues, but of an endemic culture of government and corporate horrors, affecting people all over the world. You can read about some of the abuses she revealed here. As the first whistleblower to make use of the potential of the internet, with its ability to democratise access to vast quantities of raw source information in searchable databases, she is already a hugely significant historical figure. The quantity of documents (c.750,000) that she provided to us via WikiLeaks, who published them online in searchable form (making them publicly accessible and of immense use to journalists, film makers, historians, record keepers, Human Rights organisations and other citizens) was unprecedented. Still, today, the documents are used for reference routinely by even the most unlikely mainstream media outlets. They remain a uniquely significant resource which sheds light on critical situations all over the world, even as these arise. And others say they have been inspired by Chelsea Manning’s courage to take action at great cost, including NSA whistleblower Edward Snowden (in exile) and Jeremy Hammond (serving 10 years), the source of the Stratfor hack, published as the Global Intelligence (GI) Files by WikiLeaks. Despite the vast quantity, it is very clear from Chelsea’s own statement made in court (read it here; listen to it in various forms here) in Feb 2013, that she was intentionally selective in what she chose to release, both with a view to compellingly demonstrating the big picture, and also so as not to compromise the security of the United States. As an analyst she had privileged access to material of a higher classification, and had she wished to harm her country, she could have released documents of a far greater sensitivity. The vast majority of the documents were not even classified, none were ‘top secret’, and they dealt with ‘historic’ events and not ongoing matters of security etc. What they were, however, was extremely embarrassing, and it is their embarrassment quotient, and the authorities’ intention of sending out a chilling message to potential whistleblowers, that undoubtedly earned Chelsea the vicious reprisals that she has suffered and is still undergoing. 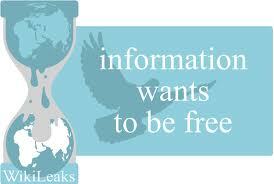 As noted above, however, this ‘message’ has clearly failed to deter people like Edward Snowden from whistleblowing. At her trial, she was not permitted to present any evidence of motivation, and the US authorities, who charged her under the ‘Espionage Act’, refused also to take into account multiple evidences that her whistleblowing caused no harm, including the results of their own damage assessments. And for Chelsea’s sentencing hearing, when the US government prosecutors wished to bring evidence of harm in order to secure as much of the the maximum penalty as they could (Life without Parole PLUS 136 years), they were unable to produce any evidence of actual harm and could only argue in terms of ‘potential’ harm. Furthermore, even the extensive review conducted by the authorities themselves into the leaks concluded that the negative impact was only low to moderate. Despite the quantity of documents Chelsea released, the US prosecutors only used 240 documents (and only parts of some of those) to bring as evidence in support of the charges, most of which were not even ‘classified’ and many of which demonstrate the vindictive, not to say bizarre, rationale behind the prosecution. 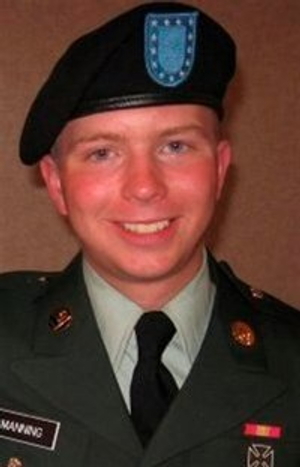 Chelsea Elizabeth Manning, who was assigned male at birth and named Bradley Edward Manning, was born in Crescent, Oklahoma, USA, in 1987, to an American father and a Welsh mother, who met in the mother’s home town of Haverfordwest, West Wales, when he was stationed nearby serving in the US Navy. Through her mother, Chelsea has both Welsh and Irish roots, though she identifies as an American. Chelsea lived in America for the first 14 years of her life, then moved with her mother, who wanted to return to her family in Wales after Chelsea’s father left them, to Haverfordwest, where she attended Tasker Milward School. In 2005, Chelsea decided to return to the US to live with her father, after which time she was openly out as a gay male. By 2007 she was living with her aunt (her father’s brother) in Potomac, Maryland. Chelsea was a ‘grade A’ student, of very quick intelligence, was highly computer literate from a very early age, demonstrated an early understanding of and interest in geo-political affairs, is reported by fellow students as caring passionately about injustice, and showed integrity by being prepared to state and stand by her beliefs even when these ran counter to prevailing ideas in the community and/or her peer group. Wanting to pursue her education, Chelsea enrolled in night classes whilst living with her aunt in Potomac, but, frustrated by not being able to devote the time she wanted to this – having to fit classes in with a more than full time job and some social life – and finding them uninspiring anyway, she decided, in autumn 2007, to join the army, then recruiting for the Iraq War, because, at that time, she believed in the mission (‘Operation Iraqi Freedom’), and also, like many other young people, she saw it as a route to her educational goals. It has been noted (and Chelsea, herself, refers to this) that enlisting in the military is actually a fairly common trajectory for trans* people identifying as female, yet assigned male at birth, who attempt to apply a ‘corrective’ to their feminine feelings by taking on what they see as a ‘masculinising’ role. 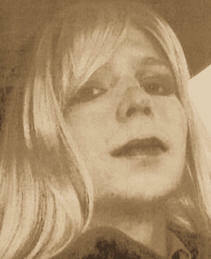 In October 2009, when she was 21, Chelsea deployed as Private 1st Class Bradley E. Manning (a name and gender she requested we used throughout her court martial and up until she had been sentenced in August 2013, after which she came out as trans*) to Forward Operating Base Hammer in Iraq, as a fully trained Intelligence Analyst – a job which she enjoyed, believed was making an important contribution, and was very good at. In December of that year, an incident occurred which she has identified as distressing, and her response to this demonstrates a key aspect of her character – empathy. For me it’s all a big mess, and I am left wondering what these things mean, and how it all fits together. It burdens me emotionally. I began to become depressed with the situation that we found ourselves increasingly mired in year after year. The SigActs [that we know as the Afghan War Diary and the Iraq War Logs] documented this in great detail and provide a context of what we were seeing on the ground. I believed that if the general public, especially the American public, had access to the information contained within the CIDNE-I and CIDNE-A tables [A + I War Logs] this could spark a domestic debate on the role of the military and our foreign policy in general as well as it related to Iraq and Afghanistan. I also believed the detailed analysis of the data over a long period of time by different sectors of society might cause society to re-evaluate the need or even the desire to engage in counter-terrorism and counterinsurgency operations that ignore the complex dynamics of the people living in the affected environment everyday. On 3rd February 2010, having failed to interest both the New York Times and the Washington Post in these documents, Chelsea decided to give them to WikiLeaks to publish. She subsequently leaked the other documents, which were published progressively through 2010 by WikiLeaks, Julian Assange managing to dodge around avoiding the US authorities (despite death threats from key figures in US public society), until they were out online at https://wikileaks.org . Whilst in the army, Chelsea seems to have acknowledged that she was suffering with gender dysphoria. In 2008, she told her next in command that she was gay (well before the repeal of the disingenuous and oppressive DADT – Don’t Ask, Don’t Tell policy, which allowed gays to serve in the military as long as they didn’t admit to being gay). By the time she was in Iraq, it appears that Chelsea was increasingly concluding that she was actually wrongly gendered as opposed to gay – she had been researching gender dysphoria – and by May of 2010, it is a matter of record that the army itself, in the person of the psychologist she saw in Iraq – Capt. Michael Worsely – formally diagnosed for the first time that she was suffering gender dysphoria, specifically on 8th May 2010. The condition was, by this stage, causing her immense distress. At this point, not only were trans* people forbidden from serving in the military (and still are, though things look to be changing on that front, not least because of Chelsea herself), but DADT for gays remained in force until it was repealed in December 2010, since when gays (unlike trans* people) have been permitted to serve openly in the US military. The pictures below show Chelsea experimenting with presenting as female, whilst on leave, and, from earlier on, joining a demo against DADT. that she was distressed enough, on 2oth May, to seek online support from Adrian Lamo, a well known hacker with an LGBQT profile, who offered a measure of solace as a ‘minister’ or ‘journalist’ (his words) in a ‘confidential confessional’, and in whom she confided not only about her gender dysphoria, but also about being conscience driven to get the documents out to the public through WikiLeaks. Despite assurances of confidentiality, according to his own testimony for Chelsea’s court martial (article 32 pretrial hearing), Lamo reported Chelsea to the authorities on 21st May, then continued to keep her talking, incriminating herself online, until she was apprehended by two officers at the base on 27th May 2010, (though she wasn’t at all clear that this was what was happening since they didn’t tell her anything, just took her to a ‘room’ without any clear explanation). Over the next couple of days she was escorted everywhere, and finally formally detained after a hearing on 29th May. Evidence submitted was of leaking the Collateral Murder video which the prosecutor said was ‘classified’ (it wasn’t), though there were no formal charges until 5th July 2010, and, then replacing these, a new charge sheet was issued in March 2011 and this then included ‘Aiding the Enemy’ (which can carry the death penalty, though prosecutors conceded they would not seek this). The details of the two charge sheets are here. That night – 29th May 2010, Chelsea was taken to Kuwait, still without any clear idea of what was happening and why. In Kuwait, she was held in a cage (still without being properly informed by anyone what was happening or why she was there) in such high temperatures (the air-conditioning didn’t work) that at one point she passed out; was subjected to twice (sometimes three times) daily ‘shakedowns’ (in common with practices at Guantanamo, guards enter the cage or cell, chucking everything in it – including bedding etc – all over the place, ostensibly to protect the prisoner from self-harm). She was made to observe day as night and night as day – starting her day at 10pm and ending it at 1pm or 2pm. At some time, a few weeks into this, the combined pressures unsurprisingly made her suicidal for a brief period (she couldn’t remember the detail of this very well when giving her witness testimony in court). She was given medication and recovered from any suicidal ideation. On 29th July, they moved Chelsea – again she was told nothing and feared she might be headed for some equivalent of Guantanamo, so she was very relieved when she realised they were going to land in the United States. She was transferred to Quantico Brig, Virginia – inappropriately a Marine brig, as opposed to an army prison. Whilst in Quantico, despite even their own psychiatric staff repeatedly saying that Chelsea was no longer a danger to herself (and not suicidal), Chelsea was (allegedly for her own protection) kept under the most restrictive regime, and was in and out of ‘prevention of injury’ and ‘suicide watch’ status. Her conditions varied, but she was required to respond every five or ten minutes to a guard enquiring if she was OK; was disturbed at night if the guards could not see her face (which was fairly often as, in her sleep she would tend to cover her face, owing to the glaring strip light on at all times and shining straight into her cell directly at her bed); her access to books and writing materials was severely limited; during the day she was not permitted to sit with her back resting against anything, and at no time was she permitted to do any form of exercise in her cell; whenever she left her cell (rare visits or for allocated 20mins/1 hour ‘exercise’) she was put into full restraints (heavy handcuffs and leg restraints chained to a waist band so that it is impossible to walk without two guards to keep you upright) and the whole block was locked down (as though she was dangerous…). Whilst at Quantico, she was in isolation the entire time, though they refuse to define it as such, because she had a guard watching her constantly (including when she went to the toilet), and there were inmates near enough to have a shouted conversation (you were not, however, permitted to raise your voice in conversation, so this can hardly be argued meaningfully). She had to sleep on a mattress with an inbuilt pillow shape (no pillow, no sheets) under a blanket which gave her a rash. She was deprived of her prescription glasses at times. This abusive and illegal pretrial punishment, described by the UN Rapporteur on Torture as ‘cruel and abusive treatment amounting to torture’, came to a head when she was stripped naked, forced to sleep naked (which meant she was actually cold, though they subsequently gave her an extremely uncomfortable chafing ‘suicide smock’ ) and humiliated by being forced to stand naked for roll call. The worldwide outcry in response to this disgraceful treatment resulted in Chelsea being moved (thus immediately invalidating the ‘suicide’ excuse for the treatment) to a ‘state-of-the-art’ pretrial facility at Fort Leavenworth, Kansas, on 18th April 2011, and held under a normal medium security regime, whereby she was able to interact with other prisoners. in a burst of candour when questioned about it at a seminar he was giving. He declined to protect his comment as ‘off the record’ when asked if it was. As a result, he was forced to resign. You can read about Chelsea’s own account (given as a witness in her court martial) of the time from when she was first apprehended on 26th May, through the time in Kuwait and the abuse she was subjected to in the brig at Quantico, and up until she was moved to Fort Leavenworth in April 2011, here, and here in Alexa O’Brien’s full transcript of Chelsea’s court testimony. This (28th November 2012) was the first time anyone had heard her speak in public, and she moved and impressed everyone in the courtroom. For more about this and people’s reactions see this post and this post (which has further links at the end). Chelsea was prosecuted as a US soldier and thus court-martialed in a military court. 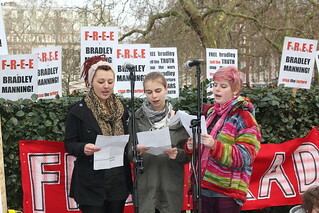 The process began, after she was deemed fit to stand trial, when, on 16th December 2011, over a year and a half after her arrest and detention (and the day before her 24th birthday), she appeared at a formal Pre Trial Hearing (known as an ‘Article 32 Hearing’), convened for a Military IO (Investigating Officer) to briefly review the evidence for the viability of a conviction. Chelsea was then formally ‘arraigned’ (committed for trial) on 23rd February 2012. Various pretrial and ‘motions’ hearings took place over the following 15 months to establish boundaries, with the trial itself actually beginning on 3rd June 2013, more than three years after Chelsea was first detained. During these pretrial hearings it was established that, at trial, she would be prohibited from presenting any whistleblower defence or evidence of motivation, and that the court would not permit any evidence of the lack of harm caused by the releases. This meant that she was only tried and convicted on the actual matter of physically leaking the documents, which she didn’t intend (with certain variations) to deny, making conviction a foregone conclusion. She would be allowed to bring the contextual (and thus most relevant) evidence for the sentencing arguments only. 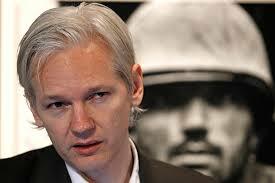 See comment on the travesty of this from Julian Assange. 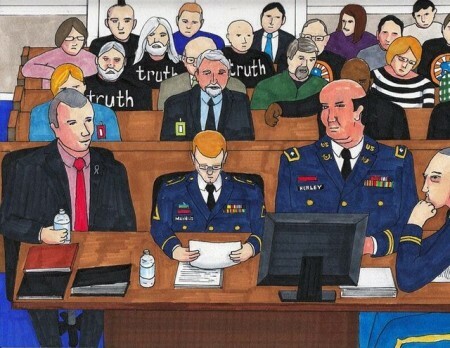 Defence motions to dismiss the charges for the illegal pretrial punishment at Quantico, and for the lack of speedy trial (something guaranteed to US soldiers by the rules governing courts martial) were denied, as were a number of attempts to dismiss the ‘Aiding the Enemy’ charge, a charge which Amnesty International described as having ‘no basis‘, and called ‘a serious overreach of the law’. Though Chelsea’s pretrial imprisonment is the longest on record, the judge ruled that her ‘speedy trial rights’ had not been unduly violated, and despite the treatment meted out to Chelsea at Quantico – treatment that David Coombs said should ‘shock the conscience of the court’ – the judge awarded her a paltry 112 days credit of her sentence. Chelsea was convicted on 30th July 2013 of 20 offenses of the Uniform Code of Military Justice, which included six violations of the Espionage Act; five counts of stealing U.S. Government Property; and one violation of the Computer Fraud and Abuse Act. At this point she faced a possible 136 years. Chelsea was not convicted of the life without parole charge – ‘Aiding the Enemy’. Resources tabling the verdict, with maximum sentence levels etc compiled by Alexa O’Brien here. See this statement from Chelsea’s lawyer, David Coombs, on why he believes Chelsea received neither a fair trial, nor a just result. Chelsea’s Sentencing Hearing began on 31st July 2013 and ended on 21st August 2013, when Chelsea was sentenced to 35 years in prison. Again, see Alexa O’Brien tables for time sentenced for each offence. The following day, Chelsea’s trial lawyer, David Coombs, appeared on prime time TV (NBC’s TODAY) and read a statement from Chelsea in which she thanked supporters, told us she was female, and asked us to respond accordingly. See this video. David Coombs said that he would be assisting Chelsea with ensuring that Fort Leavenworth (who had been reported by Adam Klasfeld at Courthouse News as saying they did not offer it) provided her with Hormone Therapy, and that they would sue for this if necessary. Chelsea’s clear reasons and intentions and a description of her time in the military are laid out in the remarkable statement which she read out on 28th February 2013 in court, and which is essential reading. You can find it both as a leaked audio, and as a transcript (divided into sections, with key sentences highlighted in red) here. It is also available in a couple of other audio forms which may be easier to understand here. The log of the chats between Adrian Lamo and Chelsea is something of a double-edged sword – without them Chelsea may well never have been outed as the source of the documents. Yet they have been an immensely valuable resource (and the only one we had for a very long time), demonstrating in the most ingenuous way possible the integrity of her motivation, and giving us a ‘fly-on-the-wall’ insight into her thinking. The disclosures she makes within the conversation have the ring of truth about them; they are unconstrained with no apparent ‘agenda’ as Chelsea would obviously have been expecting them to remain private. You can read the sections of the chat that deal with her leaking the documents on this website here. On that page also there is a link which will take you to the full logs (the chat took place over several days) insofar as we know them. Before the formal legal appeals process began, there were two other ‘appeals’. On the day Chelsea was sentenced, at the press conference following, David Coombs read out a letter to Obama from Chelsea, appealing for presidential clemency/pardon, in which she in effect ‘lays down the gauntlet’, challenging the administration. Full text in this post. You can see the full appeal to Obama submitted on 3rd September 2013, with supporting statements from David Coombs and Amnesty International, here. This appeal is not time limited, nor is it precluded by the appeals to the courts, and so is still current’. After a court martial, the convening authority has to review the record of the trial within six months, and, if satisfied, sign it off, and it is only after this that appeals to other courts can be lodged. This is therefore also an opportunity to appeal to the convening authority for clemency and a reduction of sentence, and the appeal to the convening authority – in Chelsea’s case, Maj Gen Jeffrey Buchanan – was formally submitted in Jan 2014 by David Coombs. It included many letters of support. Buchanan, however, predictably rejected the appeal, and signed off the significantly flawed court martial as good to stand. There are then a possible three levels of appeal; the Army Court of Criminal Appeals -ACCA; the Court of Appeals for the Armed Forces – CAAF; and finally, the Supreme Court. Aside from this, Chelsea becomes eligible for parole after serving ten years (dating from May 2010 when she was first detained). Chelsea’s defence team for the appeals, beginning with ACCA; the Army Court of Criminal Appeals, are Nancy Hollander, who is a highly respected human rights lawyer (also represents Mohamed Ould Slahi – ‘Guantanamo Diary’ – as well as other Guantanamo detainees) and Vincent Ward, who has experience of military law. See this post. 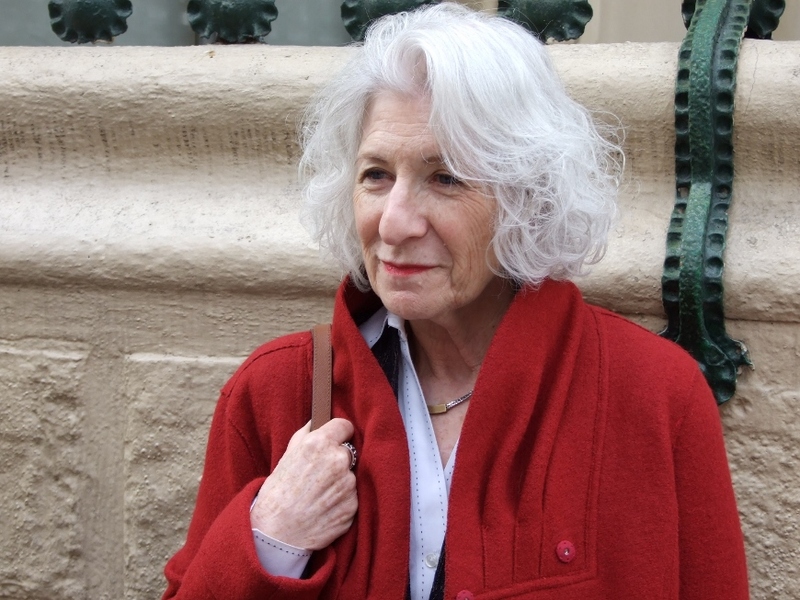 You can read two interviews with Nancy Hollander on Chelsea’s appeals etc, given while she was in Spain raising awareness of Chelsea’s case with Amnesty International at the end of 2014 here and here. For an understanding of the process which led to the need to file a legal suit to compel Fort Leavenworth to meet Chelsea’s needs according to the world protocol for gender dysphoria, and to read about the obstructive attitude and behaviour of the military to her human rights in this, please see this post and this post. Chelsea successfully challenged the military to achieve some level of acceptance of her gender, and in this she has been a pioneer for trans* rights; although hormone treatment was already available to inmates in federal prisons, trans* people are not technically even permitted to serve in the military and no-one in a military prison had received hormone therapy before Chelsea won this right in February 2015. You can trace the earlier applications she made to the military in the timeline compiled by Christine Becker here. When these failed to bear fruit, with the assistance of the ACLU, together with her trial lawyer, David Coombs, she formally threatened to sue for her needs to be met in August 2014 and filed a suit in Sept 2014. In Feb 2015, Fort Leavenworth finally agreed to provide the requisite hormone therapy. Despite this, however, they continued to deny her the right to grow her hair and use appropriate female grooming in order for her to feel her appearance reflected her true identity. 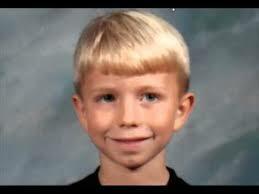 She also took action earlier on by filing for a legal name change from Bradley Edward Manning to Chelsea Elizabeth Manning in the district court, and the judge signed off on this on 23rd April 2014. Regardless of this, by Feb 2015, the US military had refused a motion from Chelsea’s defence team that they use her legal name and female pronouns, saying that they would be using her former name and male pronouns, and refer to her as a man throughout her appeals, unless instructed by the court to do otherwise. Her defence team then (Feb 2015) asked the court to rule that she be identified in court documents and appearances by her legal name and real identity, and the ruling on this went in her favour in March 2015. Chelsea is studying whilst at Fort Leavenworth, working towards a degree in Pre-Law and Political Science, doing considerable work on her appeals, and, after writing a couple of op-eds – one on the problem of an embedded media in war for the New York Times, and two; one on trans* rights and one on ISIS, for the Guardian – she joined the Guardian as a regular contributor to CiF (Comment is Free), covering war, gender and freedom of information. You can read her collected writings (as well as an interview with Amnesty International) since July 2013 here.